Nearly 44 million schoolchildren were given free textbooks for their new classes on the New Year’s Day amid festivity across the country. Education Minister Nurul Islam Nahid distributed textbooks among students at Azimpur Girls’ School and College in the capital on Monday morning. Primary and Mass Education Minister Mostafizur Rahman provided textbooks for students at Dhaka University central playground. 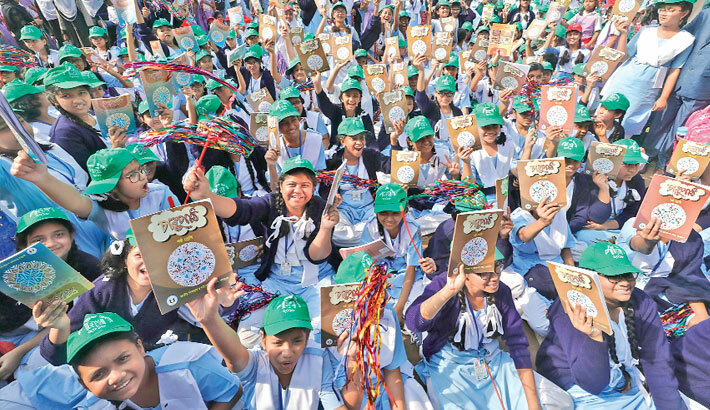 Earlier, Prime Minister Sheikh Hasina formally inaugurated the distribution of the textbooks in the capital on Saturday for the 2018 academic year. A total of 354,290,162 textbooks were distributed among 43,706,895 students at pre-primary, primary, Ebtedayee, secondary, Dakhil and technical levels. Schoolchildren thronged their educational institutions across the country amid huge enthusiasm and excitement to take new books for their new c lasses. They celebrated the textbook distribution ceremony through receiving the books. Officials at the ministry said 187,385,921 copies of textbooks were distributed among 13,035,574 students at the secondary level. A total of 103,624,405 textbooks were distributed to 21,721,129 students at the primary level while a total of 149,276 textbooks were printed for 58,255 students of ethnic groups at the pre-primary school, they added. “Free textbooks are the gift of the New Year of the present government,” he said, adding: A total of 2,608,591,290 textbooks have been distributed since 2010. He also said Bangladesh has set a rare example in the world through distribution of free textbooks among large number of students on the first day of January. Secretary of Secondary and Higher Secondary Education Division Md Sohrab Hossain, Secretary of Madrasah and Technical Education Board Md Alamgir and senior officials of the Education Ministry, among others, were present on the occasion. Primary and Mass Education Minister Mustafizur Rahman said the country’s development will not possible without progress of primary education.